Delusional Self-Blaming Disorder: those suffering from this peculiar condition, according to Zetsubou-sensei, blame themselves for everything that goes on around them. 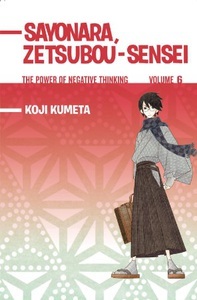 But as Zetsubou-sensei explores this affliction, he realizes that he himself is a victim! Luckily, the sensei has a foolproof plan for putting an end to Delusional Self-Blaming Disorder - which happens to involve a long rope dangling from a tree. Could this be the end of Zetsubou-sensei?